PHILADELPHIA -- Brian Boucher is well aware of the teasing throughout the media circles these days regarding the Philadelphia Flyers goaltending situation. In fact, he's content to just roll with the punches despite the fact he, Sergei Bobrovsky and Michael Leighton have at one time been labeled the man between the pipes in the last six games. When told the Buffalo scribes had referred to the three-man goaltending carousel in Philly as Larry, Mo and Curly of "Three Stooges" fame, he laughed. "That's pretty funny," Boucher said. "I can't say, but which is the one with the bald head -- Curly? That's the guy I like the most, so maybe I'll be Curly." While you probably won't be hearing Boucher use the catchphrase "Nyuk, Nyuk, Nyuk!" anytime soon, the truth of the matter is he was tabbed the starter against the Buffalo Sabres on Tuesday in Game 7 of the Eastern Conference quarterfinal-round series here at Wells Fargo Center. If he can manage to finish the game, it'll mark the fourth time in seven games that a Flyers starter went the distance. PHILADELPHIA -- Here's a look at how the Flyers' goaltending situation has panned out against the Buffalo Sabres in their Eastern Conference quarterfinal round series that concludes Tuesday with Game 7 at Wells Fargo Center. Game 1: Rookie Sergei Bobrovski goes the distance in a 1-0 loss. Game 2: Boucher replaces Bobrovsky in first period and earns a 5-4 victory. Game 3: Boucher starts and finishes a 4-2 victory. Game 4: Boucher starts and suffers a 1-0 loss. Game 5: Michael Leighton replaces Boucher in first but suffers 4-3 overtime loss. Game 6: Boucher supplants Leighton in the second and earns 5-4 overtime win. It's important to note that Boucher's backup for Game 7 will be Bobrovsky (0-1, 3.38 GAA, .875 save percentage) and not Leighton (0-1, 3.44 GAA, .862 save percentage). "Every time (Boucher) has come in, he's brought a sense of calmness that, as a team, we need and he's been able to give to us," forward Kris Versteeg said. "He's earned this start and obviously it's been a long time since he's started a Game 7 (May 26, 2000; 2-1 loss to New Jersey) but it doesn't matter to us. We're worried about going out there as a team." Despite the goalie carousel this postseason, Boucher is 3-1 in five appearances with the sixth lowest goals-against average (2.12) and sixth highest save percentage (.935) in the League. According to the Elias Sports Bureau, the last team to use three different starting goaltenders in one series was Vancouver in the opening round of the 2004 playoffs when Dan Cloutier, Johan Hedberg and Alex Auld were in the mix for then-coach Marc Crawford. The results weren't too favorable -- the Canucks dropped a seven-game series to the Calgary Flames and Miikka Kiprusoff. After incumbent starter Cloutier suffered a sprained ankle in the first period of Game 3, Crawford went to Hedberg as the replacement. He was solid in relief, turning aside 19 shots in leading the Canucks to a 2-1 win. But after allowing 3 goals on 31 shots in a 4-0 loss in Game 4 to square the series, Crawford opted for Auld the remaining three games. Hedberg, who had 18 games of playoff experience with the Pittsburgh Penguins prior to joining the Canucks for 2003-04, recalls the disappointment at getting the hook prior to Game 5. "At the time, it was very disappointing," Hedberg told NHL.com via phone from his home in Atlanta. "I thought I was having some success in Pittsburgh and the talk was that I had some playoff experience but that I had a bad Game 4. I won the first one and lost the second but had no idea that I was not going to play Game 5, so it was disappointing. You try and support as much as you can, though." While Flyers coach Peter Laviolette may show little patience in replacing his goalie, he rarely keeps his starter for an upcoming game guessing. "We know inside the locker room what is going on with the game plan but we just don't typically let (the media) in on it, so it's not like it's a new routine," Boucher said. "The only thing different is that (Laviolette) announced the starter for Game 7 right after Game 6." Laviolette had his reasons for doing that, too. In particular, he didn't want the goaltending issue to remain a focal point heading into the series finale. "I think the numbers speak for themselves … there's a tremendous amount of confidence in Brian Boucher, there's no question about that," Laviolette said. "When it comes to the series, the bottom line is, we're getting a lot of talk about goaltenders but our goals against is better than theirs (2.67 to 2.83). 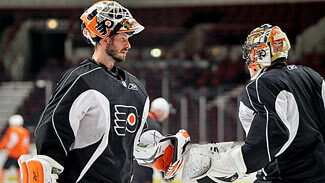 We have a lot of confidence in Brian, our team and all of our goaltenders." Through it all, Boucher's confidence has never wavered. "Personally, I feel like I have had a solid series aside from three minutes (of Game 5), so I feel good about my game," he said. "I give a lot of credit to my teammates. They have battled really hard in front of me and they really have given me a chance to get back in there with the way they played down 3-1 (in Game 6). A lot of credit goes to them." Hedberg was a respectable 1-1 with a 2.45 GAA and .922 save percentage prior to his benching in favor of Auld back in 2004. He feels a three-goalie rotation is not the way to go in the postseason. "In a perfect situation, I just think you want to have one guy playing, in my opinion," Hedberg said. "I just don't think using three guys is the best. "Anything is possible, and I guess, in the Flyers' position, using Leighton and Boucher as a starter and then having the next guy take over has worked for them. But it's probably not what they were hoping for. That said, Leighton and Boucher have come in and turned things around for the team. I think if they were to win this series, their chances would be greater if they stuck to one or two and not all three goalies." Despite what some may think, the players haven't really been fazed by the goalie changes. "We just roll with it," Flyers captain Mike Richards said. "It's the cards that were dealt. It is what it is." "It doesn't matter who's in net," Claude Giroux said. "We have confidence in any goalie that is giving us a chance to win. (In Game 6) we saw that Boucher came in pretty strong and made some key saves to keep us in the game."